The oil and gas industry makes enormous economic contributions that benefit all Canadians. Every year, the oil and gas industry pays billions of dollars in taxes to governments. Another way governments – and their citizens – benefit financially from the oil and gas industry is through royalties. A royalty is the share the Crown (usually the provincial government) receives from companies producing oil and gas from Crown-owned resources. Taxes and royalties help pay for important government services, such as education, health care and infrastructure that benefit everyone living in Canada. Finally, the investment that oil and gas companies make in Canada supports job and businesses. Many Canadian investors, mutual fund owners and pension plan holders are invested in oil and gas stocks. Canada’s oil and natural gas industry paid a total of $15 billion to federal, provincial and local governments in the form of taxes and royalties annually from 2013 to 2016 (average). That much money pays for a lot of teachers and classrooms, nurses and hospital beds, construction workers and highways. In 2016, Canada’s exploration and production (E&P) sector invested $37 billion of capital. Down from $53 billion in 2015 and down significantly from a record $81 billion in 2014 due to the decline in oil prices. 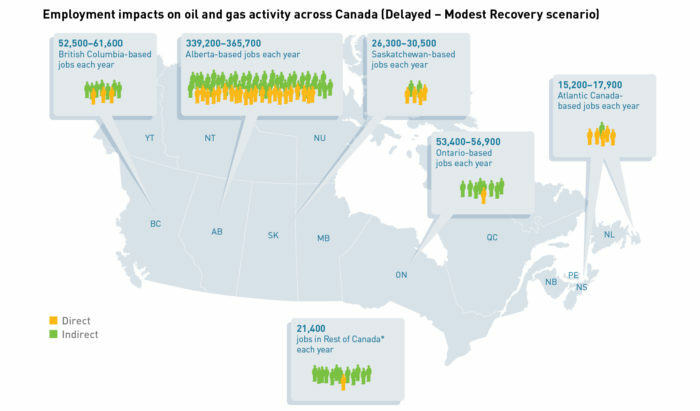 Canada’s oil and gas industry supports over 660,000 jobs, right across the country. Employees work directly for the oil and gas industry from coast to coast, indoors and outside, to help bring energy to consumers. People work in this industry because they are well-compensated for work they are trained for and enjoy, they believe in what the industry provides for Canadians, and they see a real future for themselves. The oil and gas industry supports many thousands of indirect jobs too, including those in the fields of environmental management, engineering, accounting, law, regulation, communications, safety and more. Plus there are hundreds of induced jobs employed by businesses – like hotels, coffee shops, restaurants, vehicle leasing and retail outlets – whose success depends on industry activity in and around their communities. *Rest of Canada includes Manitoba, Quebec, the Northwest Territories, Yukon and Nunavut. The direct and indirect employment impacts for Rest of Canada are the same for both scenarios. Are you interested in a career in oil and gas? Everything you need to know is at careersinoilandgas.com.